I've heard so much about Tasmania and I've had friends from there and others that have visited and loved it but, unfortunately, I haven't been there, yet. One of my good friends moved to Tassie a couple of years ago. She was living in a town called Andamooka in South Australia (a very hot place) and now she's living in Tassie which can get very cold so she's had to get used to the temperature change and, no doubt, there's been some teeth chattering going on! My sister and I are going to take a trip down there together soon because we've heard so much about how beautiful it is and you just have to look at some pictures to see how gorgeous the natural settings are, we'd both also love to see the historic sites and take some time to tour around Hobart. We put all the state information and facts into the video for you to watch. The Capital of Tassie is Hobart. 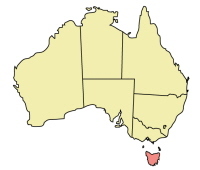 Tas is the only one of the Australian states not located on the Australian mainland. The British established a colony on Tassie (called Van Diemens Land at the time) in 1803 at Risdon Cove. Van Diemens Land became an independent colony separate from New South Wales in 1825. The transportation of convicts ended in 1853. The name Van Diemens Land was officially changed in 1856. Tas is the 6th most populated of the Australian states with about 493,300 people living there, about 202,000 of these live in the Capital City of Hobart. Other cities in the state are Launceston in the north and Devonport in the northwest. Mining is a main industry in Tas, with iron, copper, tin and zinc being mined. Saw milling and wood chipping are major industries in Tas as well. Dairy farming in the northwest and raising sheep for wool in the east are also important. Agriculture is limited almost totally to small farms. Hobart is the Capital and is the 11th city in size in Australia and the 2nd oldest after Sydney. It is situated on the estuary of the Derwent River in the south east of Tassie. Hobart was the first city in Australia to have a legal casino, called the Wrest Point Hotel Casino it opened on the 10th of February 1973. Tassie's diverse landscape and astounding scenery of glacial mountains, cascading waterfalls, dense forests, rolling green hills and pristine wild beauty make it a favourite destination for nature lovers. Almost 37% of Tas is in reserves, National Parks and World Heritage Sites. They play Aussie Rules in Tassie. A person from Tas is called a Tasmanian. The colloquial term for a Tasmanian is an apple eater or a Taswegian. Tassie is called the Apple Isle so the people are Apple Eaters and Taswegian comes from the seamen in the Australian Navy blending Tasmanian and Glaswegian. The State Flag of Tas has been in use since 1875. It shows the Union Jack and the Tas State badge. 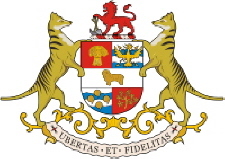 King George V granted the Tas Coat of Arms on 21 May 1917. The Tas motto is "Fertility and Faithfulness".